It is that time of year again…how does that happen?! ABC 2015 just flew by like a whirlwind. That's the All Baby and Child show in case it is not known to you. I have been attending this show since 2009 and every year there are fantastic things to discover, people to meet and visit, breakfasts and dinners to attend, and for the last 5 years there has been the BCIA Annual dinner. So much goes on during this show it's amazing anyone ever sleeps! What are my ‘takeaways’, well in the baby carrier category a few trends instantly jumped out at me. We are seeing ring slings, hip seats, wraps, and exclusive Mei Tai's...so keep reading for more details. First, the Ring Sling is King! There were so many new options that it was a bit of a tail spin to keep up. It's clear that many companies are seeing the ring sling as a great newborn option! Ring slings are available in pretty much every price point and fabric option now. A must mention is the Wrapsody Ringsling with the Sleeping Baby Productions Shoulder. This is sure to please many new families as this is a truly beloved shoulder style. There are a few players coming into the lower price point ring sling game in an effort to entice new families to ‘add on’ the ring sling. The ring sling does happen to be a great carrier to throw in your purse, diaper bag, or under your stroller and I can see why companies are pursuing the 'add on' market. It was fantastic to see Maya Wrap back at ABC! As one of the pioneers of ring slings it says a lot about the health of our industry for them to be back at ABC. This year they unveiled many new colors and a few shoulder styles as well. Maya Wrap has really grasped that each retailer knows their market best and is providing an array of options so best meet the newer demands of this clientele. It doesn’t stop here! Tula came to market in full force and their ring sling is front and center. They offer their woven wrap as a wrap-conversion ring sling which is currently a very popular option for many families. The tried and true fashion statement still is Sakura Bloom, a new line up of colors and a retailer exclusive makes this a consistent high quality ring sling that has excellent fashion sense. Like instant ‘freshening up’! Sakura Bloom also announced their new BLACKOUT collection. They are currently only available at authorized brick and mortar store. The slings even have a custom branded red/black Sakura Bloom label. Might make a great gift for this special man in your life. Sakura Bloom also brought old favorites back and added some new chambray colors. Black Cherry is my personal favorite. You can see them all in the video. The second trend is the Hip Seat. This popular trend is just hitting the North American shores in full force. Think a shelf that your baby sits on that is an extension of your hip... but one that is comfortable and lightweight and easy to transport. These are sure to be popular with the ‘up and down’ stage of babywearing and during events, at home while doing house work, and when kids want to be involved and when they just want to see what's going on. Expect to see more of these over the next few years. "I can see dads really digging this style, it's like ‘babywearing’ light. If you can put on a belt…you can put on a hip seat." The trend we saw blossoming last year that is still going strong is "the wrap”. The number of companies showing their newest materials, colors and fabric weaves continues to expand. Together these companies are bringing ‘wrapping’ towards a more mainstream option. They are making some progress if the foot traffic at many of the booths is any indication, and yes it brought smiles to my heart. 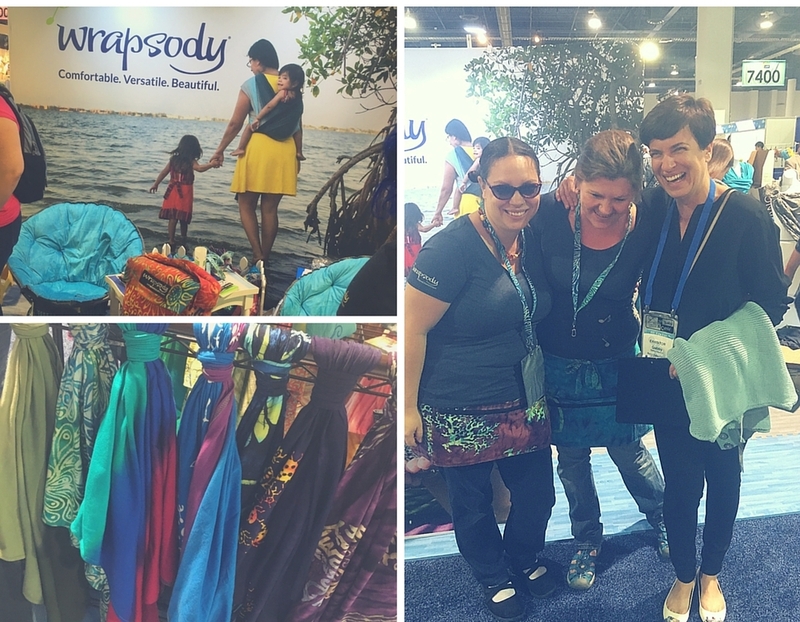 Making a splash this year was Babylonia, Wrapsody, Poe Wovens, Moby Wrap, Maya Wrap, Hug-a-Bub, and Beachfront Baby. Joanna stopped by Babylonia booth to test out the water wrap. Coming out of the Buckle carrier section was not much new..whew! I am glad to have a year off of comparing all the new changes and just have time to focus on the new colors and fabrics. Thanks! Honorable mention: not yet a trend, but watch out (!) for the custom limited edition Mei Tais from Catbird Baby and MayaWrap. Touted as the friendliest carrier style for those just starting babywearing. The retailers were all a buzz about the great new prints and limited runs, by far the most mentioned piece of the show… well... outside of the newest all black ring sling from Sakura Bloom…but go figure!